Eglinton Primary School has been involved with the Poetry in Motion Project for a number of years and I am delighted to say that the children always respond well and exceed our expectations with the quality of their poems! The programme is very well managed and the expertise of the poet coming into the classrooms really does motivate everyone and confirms that everyone has a valuable contribution to make – every child is always enthused. The children have been truly inspired, not only to write poems for this project but to go above and beyond – I have children coming to my office to share poems they have written in class, and even poems they have written in their own time at home! 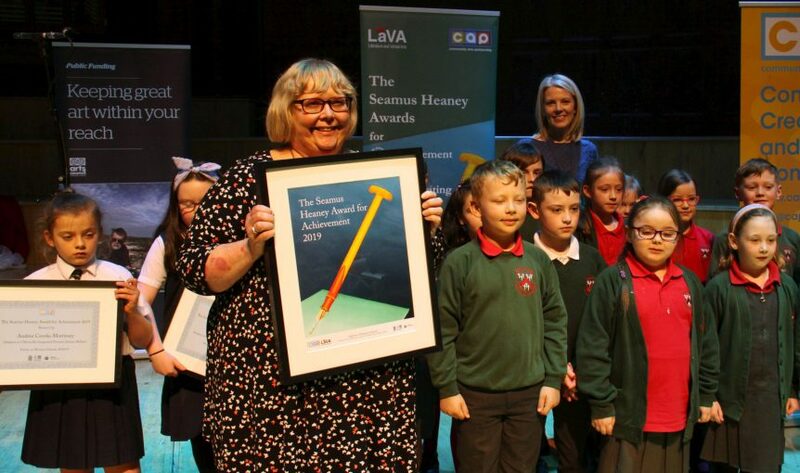 The further experiences the children gained reading their poem to an audience in the Ulster Hall has been very valuable for the children’s confidence and to be rewarded with this Seamus Heaney award – amazing! The children and their teacher couldn’t wait to share their success with school and their families. The award has been given pride of place at our school entrance, we are very proud of everyone involved.